Europe has approved the veterinary drug diclofenac, which was responsible for wiping out most of India's vulture population. If this decision is not reversed, vultures in Europe may meet the same fate. Last week a tanker collider with another ship in Galveston Bay and spilled 168,000 gallons of oil. The timing of this spill is especially bad since migrating birds are already arriving on the Texas coast. Already more than 50 oiled birds have been found, and there are probably others out there. A British study found that non-native parakeets keep native birds from visiting bird feeders. New Caledonian Crows can understand water displacement well enough to use it to retrieve a treat. A lawsuit seeks to stop development near a patch of Burrowing Owl habitat in Alameda County, California. Urban birds with darker feathers may be better at removing toxins from their bloodstream, but that has not been proven conclusively yet. Male Eurasian Jays can anticipate what food their partners want even if it is something other than their own preference. Audubon Magazine reviews some of what scientists learned about Snowy Owls this winter. The Warbler Guide was written by a New Jersey resident. The first known bluebird twins were discovered by a Project NestWatch volunteer. There is a crow-shooting contest in upstate New York this weekend. 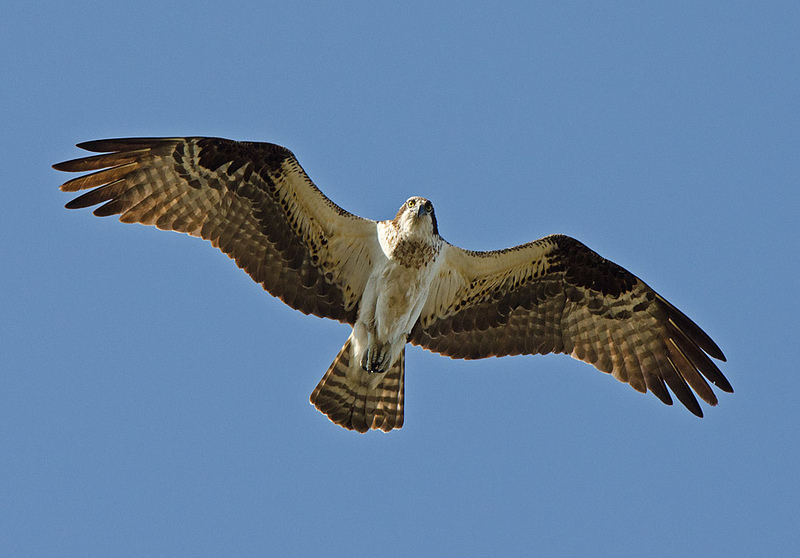 Aerial nest counts show the strong recovery of Bald Eagles in the Chesapeake region. View from the Cape: Eurasian Tree Sparrow! 10,000 Birds: Tiny Asian bird discovered as sole member of ancient family. Who’s next? Natural history has declined as a scientific discipline in favor of experimentation, but it is still necessary. Some of the gap can be filled by citizen science projects, but these still need professional scientists to guide them. This week marked the 25th anniversary of the Exxon Valdez disaster in Alaska. Even after all this time, and despite thorough steam cleaning, there is still oil on the beaches. Ice sheets in western Antarctica are collapsing faster than expected. Salamanders in the Appalachians are shrinking in response to climate change. Policymakers should heed the lessons of the Little Ice Age, when a change in climate destabilized Europe. Fish embryos develop deformities after being exposed to oil from the BP Deepwater Horizon spill. The Cuvier's Beaked Whale can dive longer than any other mammal. The red maple’s spring flowers rival its autumn foliage. The Center for Food Safety reviewed scientific literature and came to the conclusion that neonicotinoid insectides do not substantially increase crop yields (pdf) and that therefore the risk to pollinators outweighs the benefits of using them. This winter has caused high mortality for waterfowl, particularly Red-breasted Mergansers, in the Great Lakes. Here are some photos from Machias Seal Island, one of the prime spots to see an active Atlantic Puffin colony. Climate change bodes ill for the Magellanic Penguin colonies on Magdalena Island. Extinction of the Passenger Pigeon came about partly because of misunderstandings about its ecology. DNA evidence suggests that humans hunted moa to extinction. Chicken DNA provides one way to track the migration of humans across the Pacific. Seabirds are indicator species for climate change and other environmental ills. Tawny Owls are in decline, which seems to be linked to changes in the vole population. A Tawny Owl survived a 300-mile train trip, stuck to the locomotive. The word "jinx" is derived from an old bird name. Audubon Magazine had a list of green birds for St. Patrick's Day. Sadly, only one of them normally occurs in Ireland. Bird Ecology Study Group: How much do we know about our Eurasian Tree-sparrow? Expiscor: What is a naturalist? Nemesis Bird: The Rallidae rock! According to new calculations, the Earth will cross the climate danger threshold around 2036. This winter was neither the coldest nor snowiest in New Jersey's meteorological history. However, as a measure of how much the climate has warmed, it was the 3rd coldest in the last 30 years. As the Arctic tundra warms, it releases more carbon than plants can soak up. A pilot running experimental flights over the Deepwater Horizon oil spill found a new way to estimate the composition and flow rate of spills. The Narwhal's tusk is filled with nerves, which may help it detect the salinity of water. Paleontologists discovered another feathered dinosaur, but not one on the avian lineage. New Jersey rejected plans for an offshore wind farm near Atlantic City. Scientists revived moss that had been frozen in permafrost for 1,500 years. Earthworms are invasive species, with impacts on native insects and birds. Oregon may stop tracking wolf OR-7. An entomologist discovered 19 new species of mantids in the course of revising the Liturgusa genus. Mantids in this genus are unusual in relying as much on speed as camouflage in evading predators. The proliferation of invasive species (like the iceplant in California) should serve as a warming about environmental engineering having unintended consequences. The New Jersey Senate is moving a new bill to pay for open space funding, this time out of corporate taxes instead of sales taxes. Coastal erosion and climate change are threatening archaeological sites on the Alaskan coast (and on coasts elsewhere too). The Wall Street Journal interviewed David Sibley on the subject of his new field guide. See my own review of the guide. Marbled Murrelets that nest in Santa Cruz County, California, will get better protection from nest scavengers. A study of crows and ravens found that they can delay eating a piece of food if they know a better food is coming later. Scientists are trying to figure out how well penguins can cope with climate change, particularly with regard to changing sea ice levels. De-extinction is a popular idea among certain groups, but any resurrected species are likely to be very different from the originals, in both genetics and behavior. The Passenger Pigeon, for example, would have to be raised by a Band-tailed Pigeon and perhaps use some of its genetic code. Volunteers are needed for a study on Barn Swallows and light pollution. Here is a summary of the Great Backyard Bird Count results. A photographer pled guilty to violating the Endangered Species Act by getting too close to a nest occupied by endangered Snail Kites. Urban birds and plants are more diverse than you might think. Aside from a handful of cosmopolitan species, most birds and plants in a city are native to the area. Wild New Jersey: Don's Jersey Birding: "What exactly is birding?" Charismatic Minifauna: What Do You Do With Crystallized Honey? The endangered Delta Smelt won a round in federal court, but the case is far from resolved. The European Union voted to create an Arctic sanctuary, but it may still not happen. Many US cities had a top-five snowiest winter on record this winter. Meanwhile, the Great Lakes had the second-highest ice extent on record this winter. Thanks to this winter's heat wave, Arctic sea ice is already on pace for a record low during the melting season. A Supreme Court ruling that blocked a rail trail across a Wyoming resident's property should only affect a small proportion of existing or future rail trails. New research show that how apex predators affect ecosystem health is more complex than it is usually presented. More wolves have moved into Oregon's Cascades, which means that more may follow the trail blazed by OR-7 into California. Meanwhile, wolf numbers increased in Washington. Two new species of desert poppy were documented in California and Arizona. Overabundant deer hurt native plant diversity. The DC City Council called on the US Forest Service not to allow fracking in George Washington National Forest to protect the city's drinking water. Earlier this week, Democratic senators held an all-night session to call attention to the need for climate change action. New Jersey used a massive amount of road salt this winter, which will probably be deadly for freshwater aquatic life. 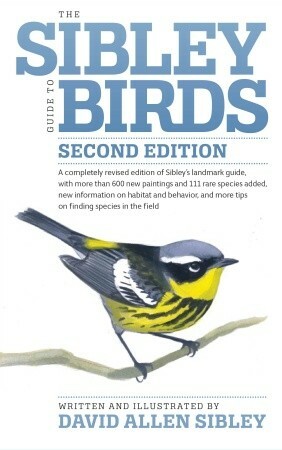 Today is the release date for the highly anticipated Sibley Guide to Birds: Second Edition. The first edition set a new standard for North American field guides, and it is still an excellent resource for bird identification. Even so, our understanding of bird identification and distribution has improved in the interim, and thus has rendered some of the older edition's material out-of-date. However, the new edition goes well beyond a simple update. Much has changed in the world of birding since the original edition was published in 2000. Many species have been documented for the first time in North America, and some birds considered rare have been shown to visit regularly. Other formerly common species are sliding toward oblivion. Some introduced species have established self-sustaining populations. Advances in genetic research have changed our understanding of evolutionary relationships among birds. As a result, many species have been split into two or more species, some genera (like Dendroica) have been eliminated, other genera (like Leucophaeus and Hydrocoloeus) have been created or restored, and families or even orders (like Falconidae and Anseriformes) have been moved to new positions on the AOU Checklist. Technology, too, changed birding considerably. News of rare birds is now disseminated quickly over email lists, social media, and eBird alerts so that more birders can see rare birds when the opportunity arises. Anyone can use eBird to find good spots for birding. Digital cameras and sound recorders have made it easier to document rare birds and interesting bird behaviors; at the same time detailed written field notes have become less common. Birders also have easier access to more information (and unfortunately some misinformation) about bird identification and behavior. The new edition reflects these changes. Despite being about the same size as the original, it includes 111 species that were omitted from the first edition. Many of these were first documented in North America in the years since the first edition was published. Others are the result of species splits or rare vagrants becoming more regular. The taxonomic order is up-to-date as of the 2013 supplement to the AOU checklist. Subspecies and regional populations also get more thorough coverage in the second edition, perhaps in anticipation of potential future splits. Beyond those updates, many plates have been retouched or repainted entirely. Images have been enlarged, and the species accounts now contain more textual information about bird identification and habitats. While the first edition contained a number of sidebars, Sibley made room in the second edition for even more of them. For example, the sidebar on owling (shown below) appears in the second edition but not in the first. Features that I liked best about the original Sibley Guide are maintained in the second edition. For one, I think David Sibley does the best job of any field guide artist (at least among North American field guides) of painting bird shapes that are true to life. Occasionally with other painted guides I see a bird shapes or postures that somehow do not look right. I have never experienced that with Sibley's illustrations. Shape is at least as important as plumage for accurate bird identification. In both editions, the diagrams showing bird topography in the introduction are tremendously useful. I refer to them constantly when I write up descriptions of rare birds to make sure my terminology is correct. The new guide also continues to show similar species in the same postures, and all but the most uncommon bird species are shown in flight. A frequent criticism of the original Sibley Guide was that some of the colors, particularly orange, were too bright. It did not bother me very much, but it seemed like a fair criticism. That seems to be less of an issue with the new edition, which has more muted reds and oranges. Some reviewers have objected that certain colors are too dark. I agree with other reviewers that at least one bird, Scarlet Tanager, looks darker than it appears in the field (at least to my eye). However, for the most part the colors look richer and more true-to-life than in the previous edition. For example, if you turn the page and look at the Northern Cardinal, the deeper red looks more like how the species appears in the field than the bright red from the first edition. I included a comparison image below, which also shows the larger size of illustrations in the new edition and some additional text (old edition on the left; new edition on the right). The maps in the previous edition were also criticized, both for their accuracy and for the sometimes confusing placement of green dots for rare bird sightings. In the new edition, the plague of green dots is gone. The maps now look more like those in the eastern and western regional guides, with gray shading to show patterns of vagrancy. For species with very limited ranges, the maps are zoomed in on the region where they occur, instead of showing the entire continent on every map. I found a few minor textual errors, but none that would make it harder for readers to identify birds. Hopefully these will be corrected in future printings of this edition. Also, the cover and binding of the second edition feel less sturdy than the first, perhaps a concession to the 50 additional pages in the new edition. When the Sibley Guide was first published, it set a new standard for field guides to North American birds. I expect the second edition will do the same. 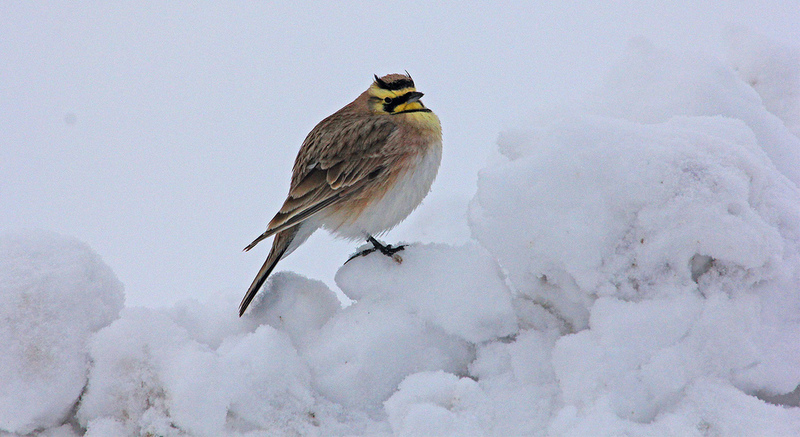 Horned Lark. Photo by USFWS / Tony Hough. The US Fish and Wildlife Service is coordinating a spring migration blitz to look for migrating Rusty Blackbirds. Please participate if Rusty Blackbirds occur in your area. The boundary between the ranges of Black-capped and Carolina Chickadees has been moving north by about 0.7 miles per year, which matches the rate of warming temperatures. The small genomes of birds and bats seem to be caused by the intense metabolic activity needed for flight. Many female songbirds sing, but most species with singing females are in the Southern Hemisphere. A new bird family (Elachuridae) was proposed for the spotted wren-babbler. Here is the journal abstract. Scott Weidensaul has an article on this year's Snowy Owl irruption. 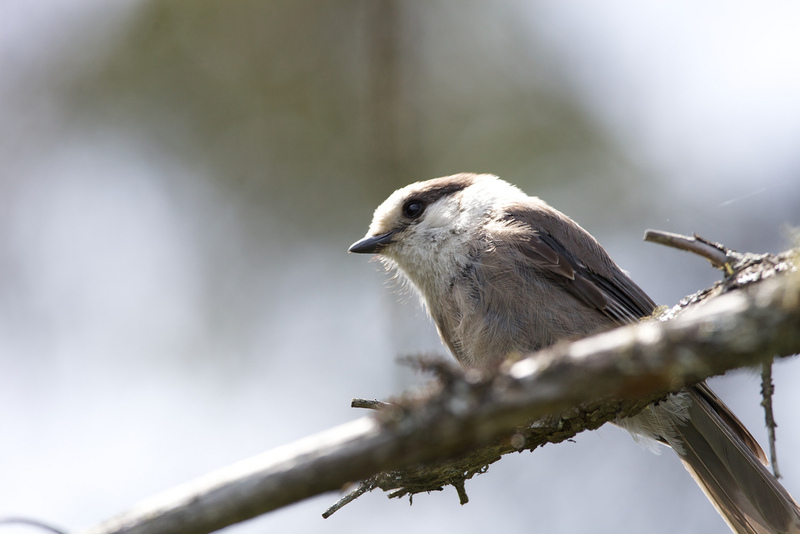 Individual birds have preferences for moving left or right to fly around obstacles. National Geographic suggests five Bald Eagle nest cams to follow. One of the first White-tailed Eagles to be bred in Ireland as part of a reintroduction program was found dead from gunshot wounds. 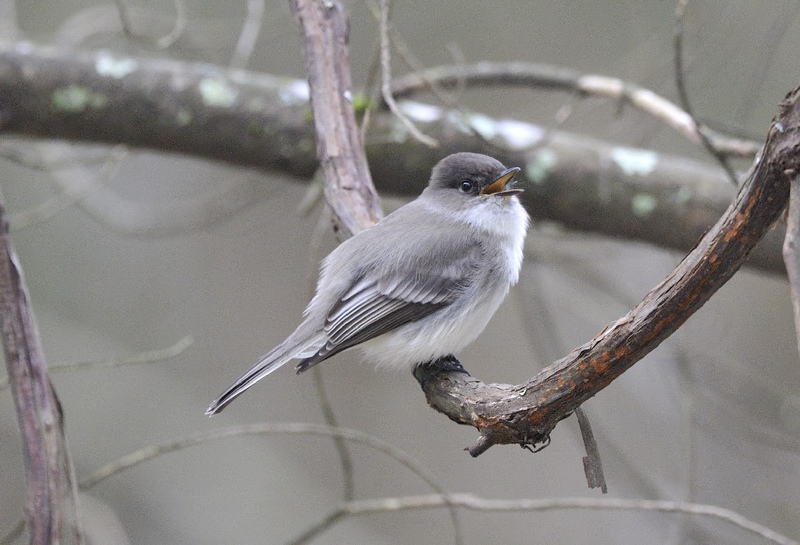 The American Bird Conservancy and Black Swamp Bird Observatory are fighting a window development planned on the Ohio coast of Lake Erie. The area is one of the prime migration corridors in North America, particularly for warblers and other songbirds. Birding Is Fun! : Do Mute Swans Migrate in North America? Pseudoscorpions in neotropical rainforests sometimes cling to the backs of beetles to move from one location to another. Deserts are home to numerous threatened or endangered species. Fragrant conifer forests such as the boreal forest produce aerosols that can induce cloud formation and reflect sunlight. While Congress dithers, businesses are already starting to take climate change into consideration for long-term planning. This year's drought has worsened air pollution in California. Meanwhile the recent rains gave Los Angeles reservoirs a 6-billion-gallon infusion. Various assessments have underestimated the toxic PAH chemicals present in tars sands oil. The prime minister of Australia thinks that too much habitat is protected. The sea otter population off the coast of Alaska has finally recovered from the Exxon Valdez spill. The NJ legislature may move a bill to allow more prescribed burns; a similar bill was vetoed in the last session.